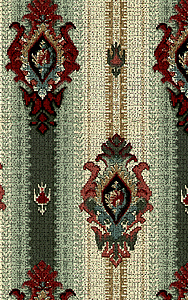 This pattern has a 16 1/2 inch repeat. Each roll is approximately 17 inches wide when trimmed, by 5 yards long or 21.25 square feet. Comes untrimmed and unpasted, and will be ganged up one or more on one continuous roll depending on rolls ordered.